When working on a big project such as renovations, you’ll probably wind up with a lot of debris when finished. Leftover refuse can quickly pile up when you’re in the middle of moving items or building large-scale fixtures. The job can’t be considered finished until you’ve disposed of everything properly. Safe and efficient waste disposal can be a challenge. If you try to move everything yourself, but there are strategies you can use to help make the work easier. 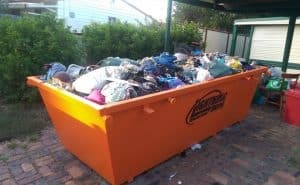 Mini skip hire in Brisbane Southside is one excellent way to make the job of cleaning up a site simpler. Also it can be less stressful than if you try to go it alone. Mini skips in Brisbane Southside come in a variety of sizes and can be used for various clean-up tasks. Finding the right company to provide you with a mini skip for hire, depends on what you’re looking for. But the best all have a few qualities that make them stand out. Good skip hire companies offer a few key features to make the process convenient for their customers. These include same day delivery and fixed prices as opposed to variable rates. Renting your skips from a company that prides itself on excellent customer service means you’ll be able to get everything packed in a stress-free way. After all, it’s only worth hiring equipment if it makes your job easier, right? One of the most reliable companies offering mini skip hire in Brisbane Southside is Lightning Skips. Providing service from Strathpine to Beenleigh and Ipswich to Wynnum, we offer fixed price skips no matter how much weight you put in them. 2m, 3m and 4m mini skips are available to help you collect and dispose of rubbish. Order before noon, and you’ll even be able to get your mini skip the same day! When you hire Lightning Skips for your waste removal, you’ll immediately be impressed by the quality and cleanliness of our equipment. Our bins will always be fresh when you receive them, boasting a bright and professional appearance so that you can feel good about using them. You’ll never have to worry about finding residue or waste from the last client in a bin you’ve hired—we make sure everything is in pristine condition when it reaches you. We always make sure that we’re doing the utmost to support the people who use our products, so if you hire from Lightning Skips, you can be certain that we’ll treat you with attention and consideration. We’re a family-owned business, and we treat every client like a friend or neighbour. Do you have questions about an order or our business? Just give us a call and learn everything you need to know from one of our friendly representatives. Contact us now on 0472 975 477 or use our online booking form to get a quote – located on our homepage!